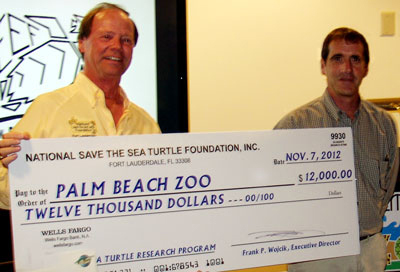 On Wednesday evening November 7th, The National Save the Sea Turtle Foundation awarded a $12,000 grant to the Palm Beach Zoo in support of their Hawksbill Sea Turtle Research and Conservation Program. The Program, now 8 years old, is the only in Florida to focus on the endangered Hawksbill Turtles that reside on the coral reefs of southeast Florida. The reception was held at the Zoo’s Levine Animal Care Complex in West Palm Beach. Palm Beach Zoo President and CEO Andrew Aiken welcomed members of the Zoo’s Board of Directors, staff and volunteers, and representatives of the National Save the Sea Turtle Foundation to the first seasonal meeting of the Zoo’s Big Cat Society. His remarks were followed by a lively presentation by Mr. Larry Wood, Zoo Biologist and founder of the Hawksbill Program that summarized the past and current research being undertaken in the waters of Palm Beach County. Following the presentation, Wayne Kurian of the National Save the Sea Turtle Foundation presented Mr. Wood with a “big check” for use on the continued efforts to study the ecology of hawksbill turtles in Florida waters.